DOWNTOWN on the shoreline of Shuswap Lake, in the Harbourfront District. "The Hudson" townhomes are now under construction. Six units, all with 3 levels and private in-house elevators. Each unit has a double tandem car garage. This unit offers 2 Bedrooms upstairs, including a stunning lakeview master suite, with full ensuite and walk-in closet. The main floor offers a flex Bedroom, which could be a den; the lower floor has another flex room that could be a Bedroom, Recreation/Craft room. All appliances included. Low monthly strata fees of $176. Rents are permitted, so also great for a holding property for your future retirement. The heating system is a hydronic infloor heating on the main floor & in the basement level as well as the upper floor bathrooms. The hydronic heat is provided by a natural gas boiler with a circulation pump. The main floor and bedrooms are also cooled by rooftop mini-split units that are also heat pumps. The Hudson is located right on the edge of the waterfront park, which offers several kilometers of level walking paths, leading to the downtown wharf, and nature trails to Raven. Walk easily to all amenities. 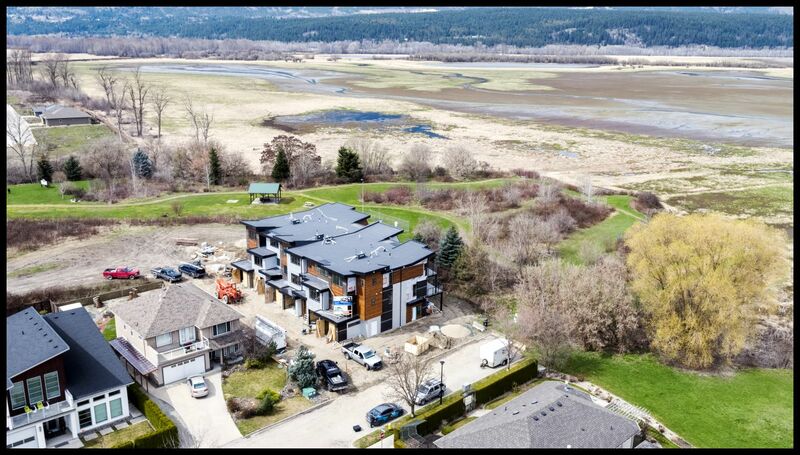 Enjoy the waterfront lifestyle, with only a park between you and The Shuswap Lake. Developers Disclosure Statement is on file for review. Call Rob McKibbon (250) 804-6288 or Toll Free 1-866-463-2791; email sold@BIGRob.ca Thank you for your interest.